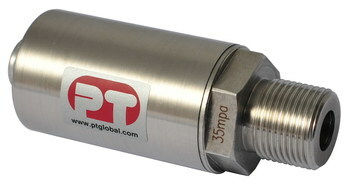 The HPT02 are high accuracy stainless steel pressure transducers sealed to IP67 with standard mechanical and electrical connections and are suitable for measuring the pressure of all types of non-crystalline liquids and gasses that are not rapidly changing, in industries such as aerospace, automotive, air conditioning, oil and gas. These are made with high accuracy foil strain gauges and are the most popular model in our range with a standard mV/V signal interfacing with a wide range of instrumentation. Each pressure transducer comes with the standard PT Ltd serial numbered accuracy certificate. Not supplied with a connector, Use existing industry standard cables or order a connector and cable pack below to make up a cable to your own requirements.